It's always hard to pick a favourite looking back on previous work but this one stands out to me. The diamond was sourced from Canada 1.20ct and so unique in shape and cut. It has fleck like inclusions but is so beautifully clear. Its imperfectly perfect. 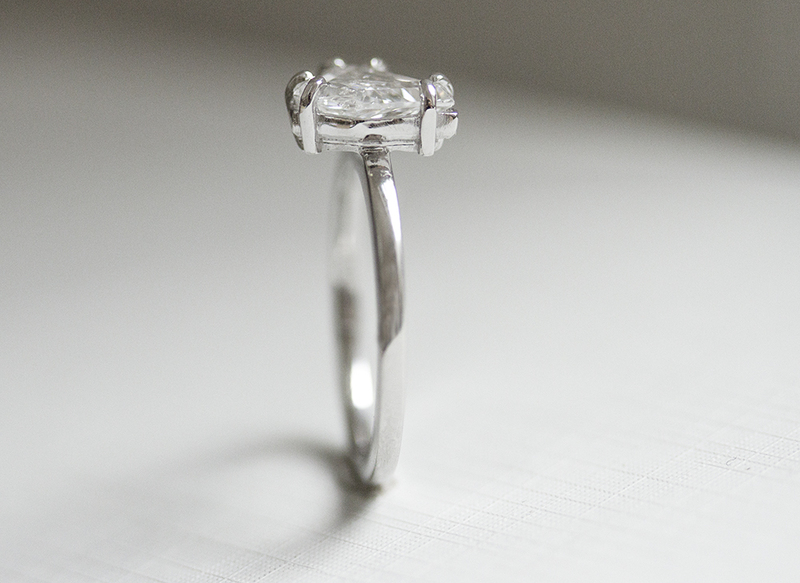 Matched with a perfectly plain band & setting it just sets off this diamond ring as a true one of a kind. Ring sizing can be a tricky business even for the professionals. It really is about finding the best fit for you. There is a lot of mixed messages and false information out there that I'm going to do my best to explain so that you can achieve the right outcome and be confident in your sizing. As a general rule I tell all my clients you want to be able to push it on easily but then twist it off. You will find at different times of the day your ring may be tight or lose as your body temperature fluctuates throughout the day. This means you are looking to get sized when you feel neither hot or cold to get your optimum fit. The best thing to do is get sized from the jeweller you are getting your ring from. There are some variables on ring sizers. Next best is another jewellers - any high street shops will have ring sizing tools and usually do this free of charge. They will get you to try on metal sizers - these come in various widths and its best if you can try the width for the band you want. AKA If you know you want a thin ring - sizing from a 2mm ring sizer is best. If your looking for a thicker band sizing from a 4mm is better. You will likely be a slightly bigger size for the wider ring. If you are getting the ring as a surprise... stealing a ring they wear is another option. If you know the ring fits well this is a safe bet. However..... I've had lots of people steal rings and they are perhaps not the best fit and so still need resized. Sometimes old worn rings are also mishapen and not a true circle so give a false reading. The other reason this doesn't always work is often your ring size is different on your dominant hand. So if your stealing a ring they wear on their right hand it can be a size bigger than their left hand if they are right handed. 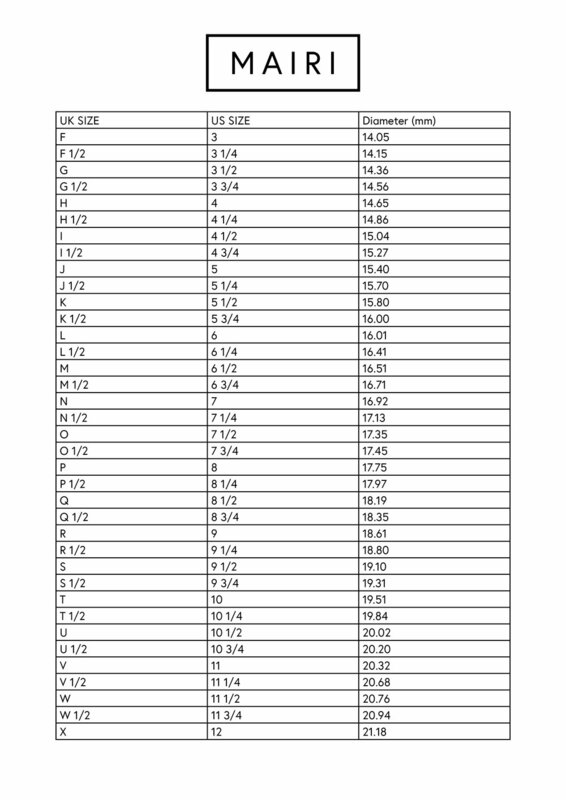 If your worried about stealing the ring away to get sized there is another option ... trace the inside of the band carefully on a piece of paper and measure the diameter then match to the chart below. A last resort would be using string, plastic sizers, downloadable paper sizers etc ... these will not give you accurate results.... I would advise against this option. If you are going to go to these lengths and share this with your partner anyway, its far better to just make the time to go to your local jewellers and get sized. It your knuckle is your widest point you will find you will have swing or movement at the base of your finger. Don't be tempted to go smaller, it is important you can take it off. I hear lots of girls joke to their partners they don't need to be able to take it off but for health reasons you should always be able to get it in on and off as you could cause yourself a serious knuckle injury and can cause arthritis in later life. If you lose or gain weight your ring size is likely to change. If you are pregnant the fluid in your body is likely to increase also and will cause swelling in your fingers. It is probably best to wait till you feel at your "normal" weight before proceeding with ring sizing. Also advised to take any rings you do have off when pregnant if your suffering with swelling. 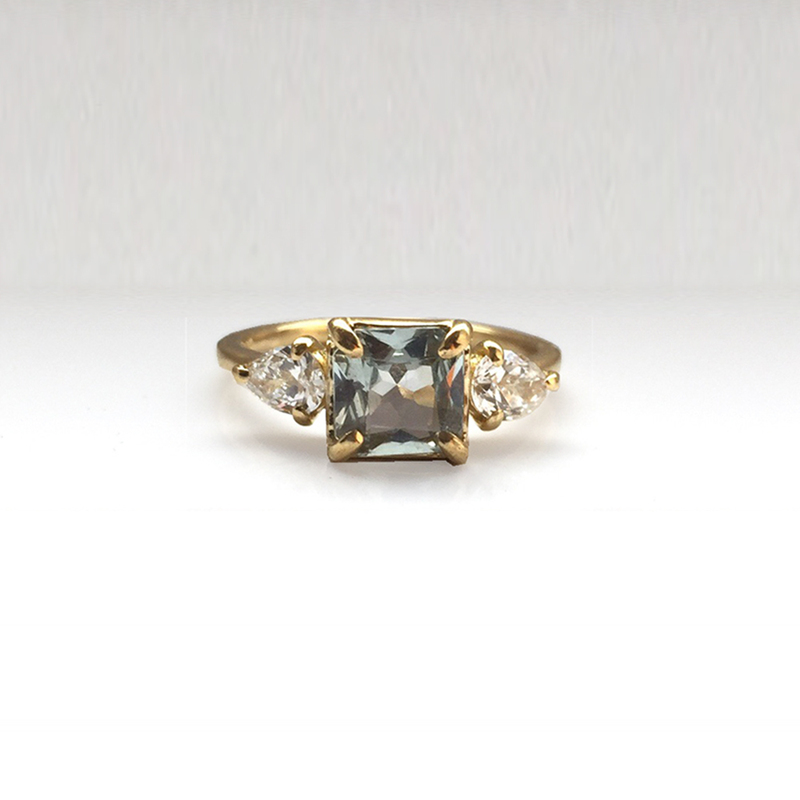 I offer a free resize with all my rings but the preferable option for both your and your ring is that it will not need resized and you can enjoy wearing it straight away. 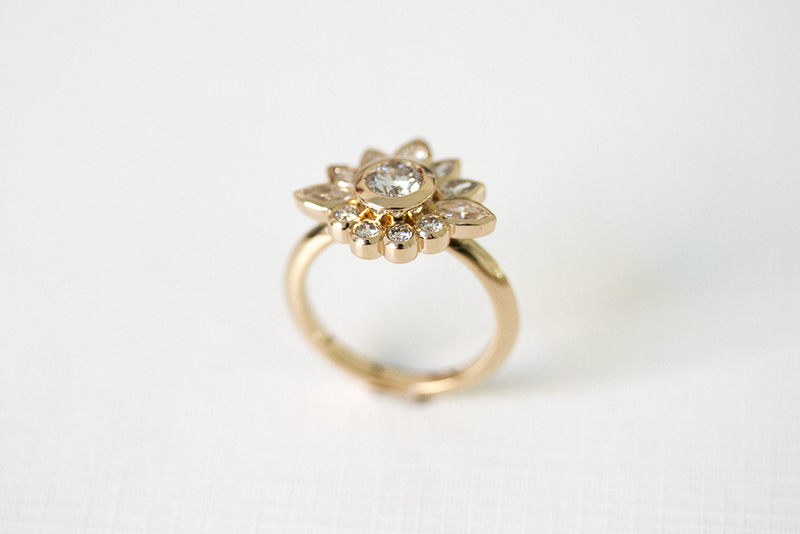 It's worth considering that not all rings can be resized due to their style/ shape /condition. Full eternity set rings can not be resized and usually it is not advised not to size up or down by more than 2 or 3 sizes. 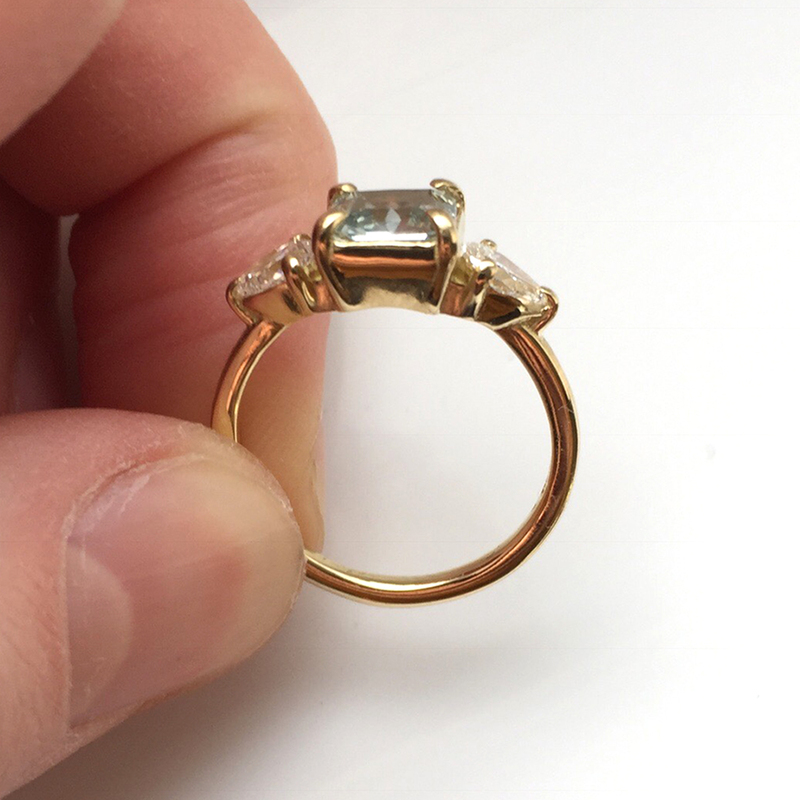 Resizing will usually leave a visible solder line on white metals or rosegold. Resizing costs £50 plus postage. Times you should avoid wearing your ring. 1. At the gym or while doing exercise - your hands are likely to swell with increased blood flow, increased temperature and become tight and cause discomfort. Contact sports can also cause injury. Metal contact with machines and equipment may damage your ring. 2. In the shower/swimming and when washing up/cleaning - soaps and grease residue will build up with ongoing exposure and moisture trapping between skin and metal can cause "ring rash". Chlorine and harsh cleaning products can also damage your jewellery or stones. Looking after your jewellery is very important. We offer a cleaning service in house but theres some things you can do at home or consider when wearing your precious pieces. Be considerate of your jewellery and its environment. It is advised you put your jewellery on last. It is not recommended to wear perfume when wearing jewellery but if you choose to always apply perfume first. Do not wear your jewellery when cleaning and take jewellery off when washing and showering as soaps and cleaning chemicals can affect your jewellery and alter its outer appearance. It is best to keep your jewellery in a box or pouch when not worn this will help reduce the tarnishing process. Matt finishes will shine up over time and will be excelled by using a polishing cloth. All our silver is sterling silver. Sterling silver is made up of 92.5% pure silver and 7.5% of other alloys. Silver is a soft metal and will show surface bruising over time and will bend on impact. Silver does tarnish and requires cleaning from time to time. We are happy to clean any pieces for you at a small charge but you may like to invest in a silver polishing cloth which you can use yourself at home. Simply give your piece a good rub and you will see the shine reappear. You may find your piece is gold plated. This means a layer of gold has been added to the surface of the silver. This will wear off over time so to minimise this avoid contact with hard surface and harsh chemicals that will rub against the surface. Store the gold plated pieces separately from your other pieces. We can offer to re-plate your pieces at a small additional cost subject to each piece. Silver jewellery is recognised with the hallmark which is stamped 925. Be considerate of your jewellery when wearing pieces that include soft stones like pearls, opals etc. They are lower on the hardness scale and will fracture on impact. Pearls in particular are porous so don't wear perfume or wash when wearing them. Diamonds and sapphires are the hardest of gemstones but can fracture or scratch on impact especially against another diamond so care when worn is advised. They are a popular and advised choice when for engagement rings because of their hardness. Diamonds can glow fluorescent in UV light as they contain tiny particles so do not panic if you are out and your diamond is glowing. Diamonds attract grease so will dull if not cleaned. You can gently rub your gemstones with a small brush and water or acquire a gemstone polishing cloth. These two metals have very similar features. The biggest difference is Platinum is rarer than Gold and much more expensive. They are both hypoallergenic metals and suitable for those that have highly sensitive skin. They can both scratch but the metal will only be displaced it doesn't wear away like silver or gold. They both usually show a hallmark of 950 but with additional information of the metal type. Gold does not tarnish although the shine can dull. 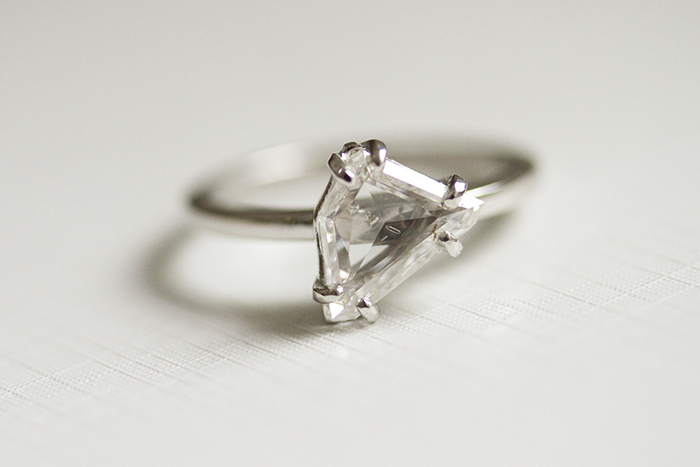 White gold is commonly rhodium plated to give it a bright white finish. White gold does require added maintenance as the rhodium plating will wear over time. It is expected to need re-plated every 1-2 years if you look after your jewellery well. Constant exposure to soaps and chemicals will mean the plating will wear off quicker. We are happy to clean any pieces for you at a small charge but you may like to invest in a gold polishing cloth which you can use yourself at home. Simply give your piece a good rub and you will see the shine reappear. If your piece is white gold you might be better investing in a gold dip solution which will clean the surface without being abrasive. Ensure you give your jewellery a good rinse after use and follow the instructions. You can get 9ct, 14ct, 18ct, 22ct and 24ct Gold. We have only listed the two carats we work with and their qualities. We have also listed how you can recognise what carat your gold jewellery is. You can get three colours of 9ct gold: yellow, white and red. Please note Mustard & Peaches does not work in 9ct red gold. 9ct gold is made up of 37.5% of gold and the other 62.5% is other alloys including copper and silver which are all varying levels to create the three colours. Some people find that they can react to 9ct gold because of the higher copper content so if you have experienced allergic reactions to metals before 9ct gold might not be suitable for you. 9ct jewellery is recognised with the hallmark which is stamped 375. You can get four colours of 18ct including yellow, white, red. 18ct gold is made up of 75% of gold and the other 25% alloys is usually copper, palladium, nickle etc. 18ct is most common for engagement and wedding bands and recommended because of its rich colours and hardwearing qualities.